The must-have book for any yogi or yogini who’s curious about taking the next step and becoming a yoga instructor. Choosing a profession begins with imagining yourself in a career. Whether you see yoga as a side gig or your life calling, Becoming a Yoga Instructor is the perfect resource to help you figure out how to get there—and what it’ll really be like once you do. 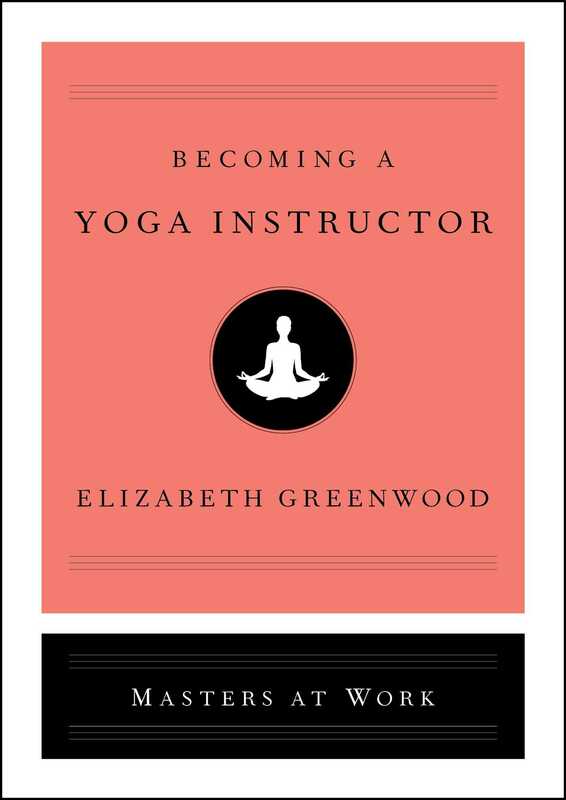 Journalist Elizabeth Greenwood has been practicing yoga for over twenty years. Now, she takes you along as she studies with teachers across the country to figure out how these women and men rose to the top of their profession—and how they stay there. In these pages, you’ll take a private lesson with Abbie Galvin, a rock star instructor whom other yoga teachers fly around the world to learn from. You’ll visit a small business owner as she opens up her very first studio, and meet newbies hustling as they figure out how to stand out from the competition, whether by leading yoga retreats to Costa Rica, helping veterans struggling with PTSD, or teaching classes over YouTube. Bursting with inside information about the yoga industry, and the spiritual, physical, and psychological benefits that daily practice can bring to your life, Becoming a Yoga Instructor is a perfect virtual internship for anyone contemplating turning their love of yoga into a career. Despite the slush and snow outside, The Studio’s main teaching salon is packed cheek by jowl with students and their requisite props. A basic Katonah setup includes a mat, two blankets, a long strap for adjustments, four blocks, and a cloth sandbag for weighing down various body parts. Several people have draped themselves over folding chairs in supported backbends, blocks under their heads and their limbs trussed up, a somewhat medieval-looking arrangement reminiscent of the rack. Other students cluster in small groups to laugh and catch up, creating an atmosphere that’s more cocktail party than silent monastery. Then Abbie Galvin enters the room. A petite sixty-three-year-old with a mop of curly brown hair highlighted with blond streaks, this unassuming yogini in Adidas wind pants and a white boatneck top is the reason the people in this room have braved the morning’s gale-force winds. She got in late last night from a training in LA, where students traveled from as far as Europe to study with her. If she’s tired or jet-lagged, she’s not showing it. Immediately she starts making adjustments, bringing another block for a fellow who’s upside-down over a chair, and pointing students—many of whom are also Studio teaching staff—to where they can most usefully provide the many hands-on tweaks Katonah yoga is known for. She notices a newbie, Margo, off in a corner in expensive leggings and a high ponytail—Abbie knows the hundreds of students who are regulars by name and face—and introduces herself. She asks Margo to sit with her feet together to create a diamond shape with her legs, and wraps a strap under her hips. Abbie is reading Margo’s feet, which is something like a palm reading, except where lines might indicate your longevity (or lack thereof) or love life (or lack thereof), the crests and wrinkles of the feet correspond to strengths and weaknesses in the body and their correlative spiritual attributes. The practice comes out of Taoism, but Abbie has made the ancient technique pragmatic. Abbie translates the lines of Margo’s feet. By now, half a dozen students have gathered around. “See how the ball of the left foot is flatter than the fullness of the ball of the right foot? That means the left lung isn’t getting enough air,” Abbie says. The flatness is the result of a dip in Margo’s hip, itself the product of her organs being “collapsed,” as Abbie terms it, or not functioning at their optimal capacities. “Ah, that makes sense,” says one of Abbie’s disciples. “Of course it makes sense,” Abbie jokes. “I’m a person who makes sense!” Her teaching style is more brassy Borscht Belt Joan Rivers than guru en route to nirvana. “Wow, it feels so awkward,” Margo observes. This is all before class has officially begun. Abbie guides us into a modified cat-cow stretch, a gentle undulation of the spinal column. But things get interesting when she asks us to cross our legs behind, and to begin flipping our wrists to “move currency” through the body. “Beautiful, Jonathan!” she shouts across the room to a fellow whose body type is more plumber than yogi. “So nice, Alex!” admiring the form of a Studio teacher with triceps sharp like knives. “Life is hard,” Abbie claps back. “You could look a little happier!” Toward the end of class, she tells us to bring our mats to the wall to use the hard surface behind us as leverage to go deeper into a lunge known as pigeon pose. “But don’t take all day!” she shouts with a smile as we find ourselves new spots. The laughter breaks through the sound of weary breathing. Abbie’s gift is seeing the wonkiness that resides in all bodies. She can spot a wrinkle in the neck or a torqued hip from across the room. She often demonstrates proper alignment on individuals, wrapping her ubiquitous strap around a waist and placing a foot into the crook of a hip to magically imbue the person with more inches and internal space, as a small cabal of teachers and seasoned students forms around her to watch. At one point, she walked all 105 pounds of her body up a gentleman’s back. Her classes are more of a workshop than a traditional flow, and devotees come not only to work up a sweat but to gain knowledge of her philosophy, both in theory and in how it manifests in the body. Abbie’s microscopic attention to detail cuts both ways. Toward the class’s close, she readies us for King of the Mountain, a pose where you interlace your fingers, palms up, and hold your arms above your head for a full nine minutes with a yoga block balancing on your palms, “your crown.” I urge you to attempt this for thirty seconds. My arms go tingly in under a minute. “Liz, you have trouble keeping your arms up, right?” she shouts to me in the farthest corner of the room, where I’ve sought refuge in an attempt to hide myself from the teacher-students and their circus-like contortions. My face flushes guiltily. I’ve been practicing yoga off and on for twenty years, and like to think I know a thing or two. After all the blocks and feet and straps have guided me into the position in which the pose is meant to be assumed, I find I can hold my arms up effortlessly for the entire nine minutes. I feel that elusive currency I’ve heard her mention coursing through my body, as though for the first time all the organs and muscles of my body are conspiring to help rather than hurt me. When I release my arms back to their sides and shake out my legs, I feel a new lightness, a flush of energy. I can see why people get addicted to this kind of yoga.